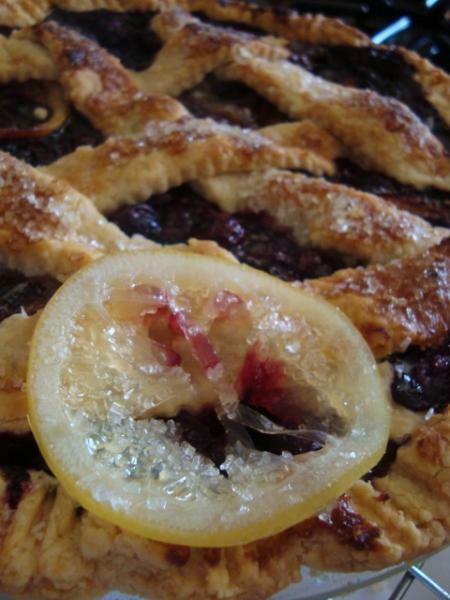 Blueberry Pie with Lemon, getting my Starter back in shape, Pizza, not today! Home > Blueberry Pie with Lemon, getting my Starter back in shape, Pizza, not today! I finally dug my starter out and brought it up to smelling good and looking strong. So now, it was time to bake a few loaves...though I'd rather be making pizza's. It has been a while since I've turned my oven on. Now the weather has cooled a little, it was nice to turn on the oven and not have the kitchen feeling to warm. I would even make a pie today. Mike was happy to hear there would be some nice sourdough bread to eat and a few loaves to stock up in the freezer. I also would make his favorite pie, Blueberry. I had a nice bunch of fresh blueberries. This time I would add a little extra lemon. Last night I prepared my lemon wheels, as I refer to them, in a simple syrup. It turned out it was an interesting and delicious addition to my BP. I will definately do this again. The added candied lemon wheels tasted wonderfully lemony, not bitter or to sweet, just a nice balance of pure lemon flavor added to the not to sweet blueberry filling. I added 3 of the thinnest wheels on top of the bb filling, just enough I think. I baked six loaves of bread. They were very flavorful with a lovely just enough sour and wheat flavor notes. The smell is wonderful. It was just a few changes to my usual all white sourdough. 20% organic whole wheat flour, a little agave syrup, a little grape seed oil and scaled to make enough loaves to fill 6 of my banneton baskets. Mixed by hand and a long overnight ferment. I also mixed up a batch of pizza dough with Caputo Tipo 00 Italian Flour and placed it into the freezer...just in case I decide to fire up the wfo this week and a gentle breeze comes to the neighborhood. Not the most attractive pie I've made but it timed perfectly with the last loaf of bread coming out of the oven. So Mike could enjoy a slice, heading off to work, it was sliced a bit warm before setting up properly cooled. The texture was just right..not runny, wet, resulting with a nice crispy tender bottom crust. To much sugar in your filling is one of those things that will make for a very runny pie and soggy undercrust! The crust was a combination of butter and crisco, salt, sugar, water. My old standby, favorite, flakey, tender, flavorful crust. We also enjoyed a cuban style pork shoulder roast and fresh roasted brussel sprouts for dinner.